Top: members of the United Partisan Organization (FPO) in the Vilna Ghetto, one of the first armed resistance organizations established in the Nazi ghettos during World War II. The ghetto uprisings during World War II were a series of armed revolts against the regime of Nazi Germany between 1941 and 1943 in the newly established Jewish ghettos across Nazi-occupied Europe. Following the German and Soviet invasion of Poland in September 1939, Polish Jews were targeted from the outset. Within months inside occupied Poland, the Germans created hundreds of ghettos in which they forced the Jews to live. The new ghettos were part of the German official policy of removing Jews from public life. The combination of excess numbers of inmates, unsanitary conditions and lack of food resulted in a high death rate among them. In most cities the Jewish underground resistance movements developed almost instantly, although ghettoization had severely limited their access to resources. The ghetto fighters took up arms during the most deadly phase of the Holocaust against the Nazi plans to deport all prisoners – men, women and children – to camps, with the aim of their mass extermination. Armed resistance was offered in over 100 ghettos. Some of these uprisings were more massive and organized, while others were small and spontaneous. The best known and the biggest of such uprisings took place in Warsaw in April–May 1943, and in Białystok in August. In the course of the Warsaw Ghetto Uprising 56,065 Jews were either killed on the spot or captured and transported aboard Holocaust trains to extermination camps before the Ghetto was razed to the ground. 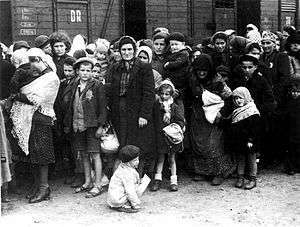 In Białystok approximately 10,000 Jews were led to cattle trains immediately afterwards. There were other such struggles leading to the wholesale burning of the ghettos such as in Kołomyja (now Kolomyia, Ukraine), and mass shootings of women and children as in Mizocz. ↑ Marek Edelman. "The Ghetto Fights". The Warsaw Ghetto: The 45th Anniversary of the Uprising. Literature of the Holocaust, at the University of Pennsylvania. Retrieved 2 October 2013. ↑ "Resistance in Ghettos". Jewish Uprisings in Ghettos and Camps, 1941–1944. Holocaust Encyclopedia. June 10, 2013. Retrieved 9 January 2014. ↑ "Jewish Resistance". United States Holocaust Memorial Museum. 2011. Archived from the original on January 26, 2012. Retrieved 9 January 2014 – via Internet Archive. ↑ "April–May 1943, Warsaw Ghetto Uprising". Timeline of Events. United States Holocaust Memorial Museum. 2013. Retrieved 9 January 2014. ↑ "World War II: Warsaw Ghetto Uprising". Originally published by World War II magazine. 12 June 2006. Retrieved 4 September 2014. See also: Stroop Report for supplementary data. ↑ Marcin Wilczek (19 April 2011). "A Somber Anniversary". ZSSEDU. Retrieved 4 September 2014. ↑ Sara Bender (2008). The Jews of Bialystok During World War II and the Holocaust. The End of the Ghetto. UPNE. pp. 253–263. ISBN 1584657294. Retrieved 26 October 2015 – via Google Books preview. ↑ "Warsaw Ghetto Uprising". Holocaust Encyclopedia. Holocaust Memorial Museum, Washington DC. 2012. Archived from the original on October 28, 2012. Retrieved 9 January 2014. ↑ Eve Nussbaum Soumerai, Carol D. Schulz, Daily Life During the Holocaust], p. 124. ISBN 0313353093. ↑ Photographs of the Mizocz shootings in the USHMM collection (No. 17876, 17877, 17878, 17879). Retrieved 26 October 2015. ↑ "Map of the Jewish uprisings in World War II" (PDF file, direct download 169 KB). Yad Vashem. 2013. Retrieved 9 January 2014. Jewish Armed Resistance and Rebellions on the Yad Vashem website. Retrieved 9 January 2014.